Urie Bronfenbrenner (1917-2005) was a pioneer in studying the behavior of children in their natural life space of family, school, peer group, and community. His concept of the ecology of human development is transforming practice for effective work with children and youth. Bronfenbrenner’s research highlights the power of human relationships to propel children on pathways to problematic or positive life outcomes. World-renowned child psychologist Urie Bronfenbrenner was Professor Emeritus of Human Development and Psychology at Cornell University at the time of his death September 26, 2005 at age 88. He was the author, co-author, or editor of more than 300 articles and chapters and 14 books exploring the field he created, the ecology of human development. Outside of his profession, he is best known as co-founder of the Head Start program which has touched millions of children of poverty. Urie Bronfenbrenner was born in Moscow, Russia, on April 29, 1917, and came to the United States with his family at age six. His father was a physician in a New York institution for the developmentally disabled. Young Urie was deeply influenced by seeing his father’s frustration when the juvenile courts consigned healthy children to the institution. This early interest would lead him to become a scholar on the child and family in various cultures (Bronfenbrenner, 1970). Urie and his wife of 63 years had ample opportunity to put these principles into practice as parents of six children. A former student2 gave this account of Bronfenbrenner’s profound commitment to teaching which he called “doing God's work.” The student was in the professor’s office when they were interrupted by a phone call. After greeting the caller with typical enthusiasm, Urie promptly said, “I’m sorry but I–ll have to call you back. I’m meeting with a student.” He hung the phone up and remarked, “Walter Mondale .... What a wonderful man.” Urie had just told the vice president of the United States that an appointment with a pupil takes precedence over a phone call from the powerful (Steinberg, 2005). Urie translated this principle into simple, powerful terms: “Every child needs at least one adult who is irrationally crazy about him or her.” To help meet a child's needs, the primary caregiver should also have the support of another adult, such as a spouse or grandparent. But in modern society, this three-way alliance has been disrupted by solo parenting and the loss of extended families. Bronfenbrenner’s life work is summarized in Making Human Beings Human (2005) which he hoped would shape research, policy and practice. He describes how the necessary supports to rearing healthy children break down amidst the chaos and hectic pace of modern society. Youth show the signs of this break-down in alienation, apathy, rebellion, delinquency, and violence. Without a sense of belonging rooted in a secure caring bond, children cannot thrive and reach their full potential. Involve adults directly in the life space of children, rather than warehousing students in stockade schools or letting peer groups dominate youth development. Involve youth in finding solutions to problems, rather than having them grow up disengaged from the community without ever making contributions to others. 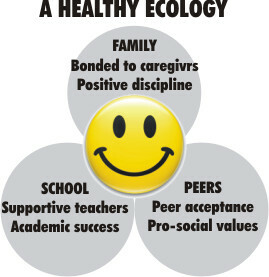 These principles became the basis of ecological models of education and treatment for troubled and troubling children (Hobbs, 1982; Brendtro and Ness, 1983). Positive youth development requires caring parents, supportive teachers, and positive peers. In simpler cultures, the entire community shared in socialization of the young. But today, many youth are disconnected from their elders and learn values and behaviors from marginal peer groups (Neufeld and Mat”, 2005). 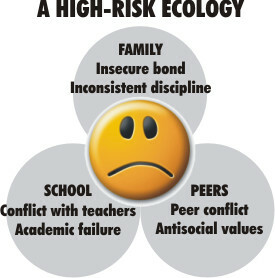 Children reared in disrupted ecologies experience a host of emotional and behavioral problems. But Bronfenbrenner opposed diagnosing such problems as pathology or disease in the youth. Instead, he diagnosed DIS-EASE in the ecology. The accompanying figure contrasts a healthy and a high-risk ecology. A child's behavior reflects transactions within these immediate circles of influence. One can only gain an accurate understanding of a child by attending to transactions within the family school, peer group, and neighborhood. This view challenges narrow approaches to assessment instruments which target the child as the problem. From the ecological perspective, it is pseudoscience to assume that an observer can tick off checklists of isolated behaviors or traits of the child and feed such data into a computer to profile a child's personality. The different spheres of influence in the child's world also impact one another. Ideally the family school, and peer group all work in harmony to provide positive support and instill solid values. But when they operate in conflict, this “dis-ease” translates into distress for the child. This is seen when teachers undermine parental values, parents undercut teachers, and peer values sabotage those of elders. Behavior is not an isolated act but a reciprocal transaction with others in a child's life space. In the family a parent influences a child, but the child also influences the parent. Once a child enters school, the teacher impacts the student, but the student also has an effect on teacher behavior. By adolescence, the peer group can rival and sometimes surpass the family and school as an agent of influence. The ecology of childhood is not static but rather changes over time. This calls for a longitudinal perspective on growth and development. As they mature, children face new challenges. Predictable developmental milestones include normal life transitions such as starting school or getting a job, but many developmental challenges result from random, unplanned events. These can be stressful, like divorce of parents, or supportive, like finding a mentor. Past behavior problems need not predict future adjustment. As the child's ecology changes, so does the child's fate (Lewis, 1997). Biological factors are also at play in development, such as irritable temperament or medical problems. Since stress is both psychological and biological, any complete theory of behavior must be bio-ecological in scope (Bronfenbrenner, 2005). For example, we now know much more about how a child's normal or delayed brain development determines how a child copes with challenge and stress. We are also aware of how relationship trauma from earlier disruptions in attachment or maltreatment can influence ongoing emotional and behavioral development. Bronfenbrenner (1976) strongly criticized much traditional psychological research as the study of isolated behavior in artificial situations for a very short time period. He scoffed at the notion that “solid research” was limited to laboratory studies, statistical analyses, and random assignments to controlled conditions. Just because data is statistically significant does not mean it is useful or relevant to practice. A narrow focus on microbehaviors obscures the real meaning of behavior. Practical studies of children are heuristic: they explore how a child experiences and interprets his or her world. Popular diagnostic schemes slap deviance labels like “disruptive behavior disorder” on children experiencing problems. Bronfenbrenner argued that conflict is a performance which requires multiple actors. He described a mirror-image process which operates at interpersonal to international levels (Bronfenbrenner, 1961). Once one becomes locked in conflict with a perceived enemy, it is excessively difficult to empathize with the view of the other. The logical brain is overwhelmed by primitive survival impulses. The adversary is seen as an evil aggressor, while the self, of course, is the noble victim. This image is so intense that it overrides reason and conscience; one justifies attempts to punish and attack, even when this makes the situation worse. Hostility fuels hostility something Nick Long (1995) calls the “conflict cycle”. Brain research now shows that this tendency to imitate others is programmed in the brain's “mirror neurons” (Dobbs, 2006). Bronfenbrenner sought to elevate practical studies of children in their life space to the highest levels of science. He relabeled traditional experimental studies as contrived research. He also considered narrow animal-based learning models as overly simplistic when applied to humans. While welcoming diverse methods of inquiry Bronfenbrenner tipped the balance of the research agenda toward naturalistic studies. The goal was to study a child's natural relationships under natural conditions. What are the transactions of the child with family peers, and school? Does this circle of influence create stress or offer support for the child? When the ecology is in balance, children live in harmony with self and others. But if the ecology is disrupted or in tension, the child experiences conflict and maladjustment. The most powerful interventions with children and youth are those that seek to build a supportive ecology around a child. Certainly it is valid to concern oneself with broader social policies, but the most direct impact is on the children in his or her immediate sphere of influence. Discouragement from destructive forces in the broader society cannot take such priority that it hides the powerful influence one can wield in the life of a child. Bronfenbrenner invested great personal energy and political skill in seeking to change cultural values, economic systems, and public policies that are antagonistic to positive youth development. His ecological research sparked the Head Start movement for disadvantaged children. His advocacy before the United Nations forged international children's policy. His ecological model transformed the helping professions. Urie Bronfenbrenner was a deeply compassionate man committed to the belief that there are no disposable children (Brendtro, Ness and Mitchell, 2005). His vision was rooted in boyhood memories of his father struggling to reclaim cast-off troubled children in an institution. For all of his fame, the spirit of this pioneer is his enduring epitaph: Every child needs at least one adult who is irrationally crazy about him or her. Brendtro, L., Ness, A. and Mitchell, M. (2005). No disposable kids. Bloomington, IN: National Educational Service. Brendtro, L. and Ness, A. (1983). Re-educating troubled youth: Environments for teaching and treatment. New York: Walter du Gruyter. Bronfenbrenner, U. (1961). The mirror image in Soviet-American relations: A social psychologist’s report. The Journal of Social Issues, 17, 3. pp. 45-56. Bronfenbrenner, U. (1970). Two worlds of childhood: US and USSR. New York: Russell Sage Foundation. Bronfenbrenner, U. (1976). The experimental ecology of education. Teachers College Record, 78, 2. pp. 157-204. Bronfenbrenner, U. (1986). Alienation and the four worlds of childhood. Phi Delta Kappa, 67, 6. pp. 430-436. Bronfenbrenner, U. (1991). What do families do? Institute for American Values, Winter / Spring, p. 2. Bronfenbrenner, U., (Ed.). (2005). Making human beings human: Bioecological perspectives on human development. Thousand Oaks, CA: Sage Publications. Bronfenbrenner, U., McClelland, P., Wethington, E., Moen, R and Ceci, S. J. (1996). The state of Americans: This generation and the next. New York: The Free Press. Dobbs, D. (2006). A revealing reflection. Scientific American Mind, 17, 2. pp. 22-27. Hobbs, N. (1982). The troubled and troubling child. Reprinted 1994. Columbus, OH: American Re-Education Association. Lewis, M. (1997). Altering fate: Why the past does not predict the future. New York: The Guilford Press. Long, N. (1995). Why adults strike back: Learned behavior or genetic code? Reclaiming Children and Youth, 4, 1. pp. 11-15. Morse, W. (1985). The education and treatment of socio-emotionally impaired children and youth. Syracuse, NY: University Press. Neufeld, G. and Mat”, G. (2005). Hold on to your kids: Why parents need to matter more than peers. New York: Ballantine Books. 1. Under the leadership of Henry A. Murray of Harvard, his colleagues included Edward C. Tolman, David Levy Theodore Newcomb, and Kurt Lewin (Bronfenbrennen 2005). 2. The student was Laurence Steinberg of Temple University. 3. Bronfenbrenner referred to the immediate environments of family, school, peers, and neighborhood as a child's microsystem. The interconnection of these environments is the mesosystem. Surrounding these spheres were increasingly broader circles of community influence called the exosytem, and, finally the cultural and societal forces of the macrosystem. In designing restorative interventions for individual children, the focus is usually on relationships in the microsytem and mesosystem. Research suggests that the more immediate the system, the greater its impact on development. Thus, while poverty can be a negative force in development, the immediate forces in a particular child's family school, peer group, and neighborhood exert greatest influence. This feature: Brendtro, L.K. (2006). The vision of Urie Bronfenbrenner: Adults who are crazy about kids. Reclaiming Children and Youth, 15, 3. pp. 162-166.